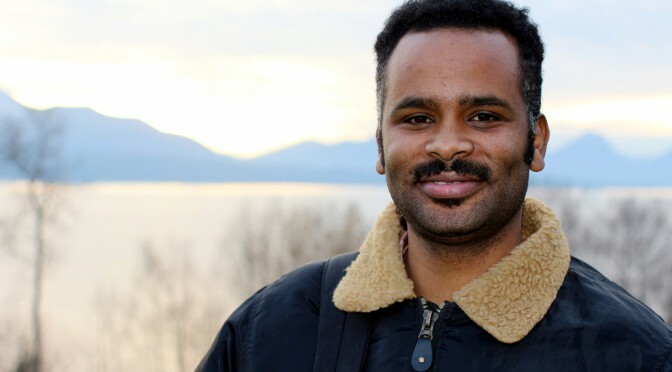 Molde’s MSc student Yohannes Yebabe Tesfay (31) played the beer game in a supply chain management (SCM) course and went on to get his statistical analyses of this simulation published in a Level 1 scientific journal. Tesfay’s article, titled «The Bullwhip Effect: Applying Stochastic Models on Beer Distribution Game», was recently published in International Journal of Applied Logistics. The journal is rated as a Level 1 publication on the Norwegian Scientific Index, and the publishing of the article rewards Molde University College (MUC) with one publishing point. This one point is worth over 30 000 NOK in government funding to stimulate the university’s scientific achievements. Previously the Ethiopian, studying for a master’s degree in supply chain management, has published a scientific article about Statoil sea transport in the Level 2 journal Transportation Research Part D, an article that rewarded MUC with three publishing points. With four publishing points acquired so far this year, Tesfay stands out on Molde Campus. Last year, only two members of the Molde academic staff produced more than four publishing points. In the Supply Chain Management 1 (LOG711) course at MUC the beer distribution game is played by students to simulate the Bullwhip effect (Forrester effect). In the game, which has been used in US business teaching since the 60’s, the actors (students) in the beer supply chain experience that the absence of information about consumer demand causes high inventory levels and stock outs, both upstream and downstream in the chain. Tesfay used different stochastic models to analyze the data from the simulation, such as ANOVA, spectral density estimation, ARMAX and Cochrane-Orcutt autoregression, and found that two of the four actors in the chain performed poorly on intra-organizational coordination, and that all four performed poorly on inter-organizational coordination. “The best performers in a supply chain should help their business partners to perform better. That will reduce costs for each actor and the supply chain as a whole,” Yohannes Yebabe Tesfay says. In his article he states that each company has to identify their internal problem and establish appropriate, flexible, dynamic and responsive intra-organizational coordination, and that companies need to identify their partners and properly coordinate for jointly increased profits. He argues that lack of coordination in supply chains has negative implication for the welfare of a given country, since the Bullwhip effect for some chains causes 13 to 25 percent of operation costs. Tesfay recommends that governments should focus on antitrust policy and how this policy affect effective coordination. Since the beginning of the 90’s, MUC associate professor Øyvind Halskau have used the beer game as at pedagogical tool to illustrate the Bullwhip effect, but this is the first time a student playing it on his course has resulted in publishing of a scientific article. “Some students are disappointed that we don’t serve beer when playing the game, but I joke and tell them that for every unit of inventory they have to buy me a beer, and that every unit stock out will cost them two beers. I guess Yohannes Yebabe Tesfay still owes me a couple of beers,” Halskau says, while demonstrating how the beer game is played. Halskau is worried that Panorama will expose too many facts about the beer game. This, in his opinion, ruins much of the learning experience the game provides. On Molde Campus the game is played with actual cards. According to Halskau, one of his American colleagues originally used to let the students play the game on computers. But the students often suspected that the computer were programmed to cheat om them, so Halskau’s colleague had to use paper cards, note sheets and pens to make the game convincing for her students.